Key difference: A determiner precedes a noun or a noun phrase by introducing it to the reader/listener. An adjective describes a noun by providing some information about it. Articles: Articles double up as determiners in a sentence when placed before a noun or a noun phrase. The article ‘the’ is called as a definite article as it points to a particular thing being mentioned in the sentence. Whereas, the articles ‘a’ and ‘an’ are called as indefinite articles as they can refer to a class of noun being mentioned in the text. Demonstratives: Words like ‘this’ and ‘that’ feature in this category of the determiners. They are used to demonstrate an object being talked about in the sentence. Sometimes, such words play as the subject in a sentence. These words basically function as pointers. Possessive determiners: As suggested by the term, these words are used to show possession of an object, a person or a place. Words like my, mine, his, her, their, our, etc. feature as possessive determiners in the English language. Quantifiers: These words reveal the quantity of the noun being mentioned in the text. They quantify nouns through words like many, few, several, etc. Words like these are often associated with nouns that bear relevance to numbers. Attributive adjectives: These are the adjectives that are part of the noun phrase in a sentence. They usually precede the noun present in the phrase, of which they describe a quality. For instance, in the phrase ‘crazy person’, the word ‘crazy’ is the adjective used for person, which means that being crazy is actually an attribute of the person being mentioned. Predicative adjectives: Adjectives like these are tagged to the noun or the pronoun that they modify. For instance, the word ‘busy’ in ‘they seem busy’ is a predicative adjective. The word ‘happy’ in a phrase like ‘they are happy’ is also an example of predicative adjective. Absolute adjectives: As the name suggests, absolute adjectives are definite in nature. These adjectives cannot be used in comparative sentences. This is because these adjectives cannot be further intensified. For instance, words like ‘unique’ and ‘perfect’ can be said to be absolute adjectives. One can’t exaggerate these words to be ‘unique-er’ or ‘perfect-er’. These shall remain as they are, or absolute. Nominal adjectives: Nominal adjectives are adjectives which act almost as a noun. For instance, in the sentence ‘given a choice of two candies, I would like to have one and return the other’; the word ‘other’ plays the nominal adjective. This word is actually short for ‘other candy’, or ‘other one’. However, the word ‘other’ itself suffices for the cause. 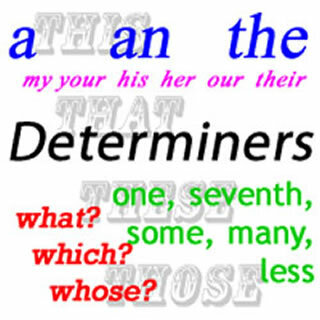 Therefore, determiners and adjectives are both vital in providing context to a sentence. A determiner precedes a noun or a noun phrase by introducing it to the reader/listener. An adjective describes a noun by providing some information about it. I love this delicious pasta.